The SIU-E cross country course was the host site for the Edwardsville Invitational where more than 20 schools competed in both the girls and boys varsity races. While Edwardsville ran well as a team to capture both team titles, team leaders in both races got the overall win. Waterloo's Jenna Schwartz (Sr) got things started in the girl's race to set the pace for the first mile, despite getting over being sick recently. 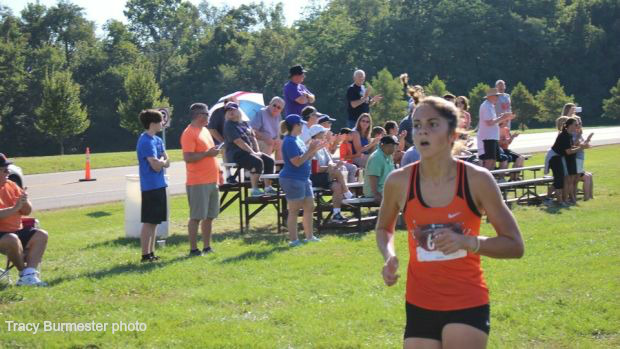 She continued to lead coming into view just before hitting the two-mile, with about 20 seconds on the second place runner, Abby Korak (Jr) of Edwardsville. Both girls looked strong heading for the finish with a time under 19 minutes on the clock, but Korak proved she had a little more left in her. With roughly 100 meters to the finish line, Korak took the lead for the first time over the 3.1 mile span and crossed at a time of 18:58 for first; Schwartz followed in 19:03. Kylie Goldfarb (So) of St. Louis John Burroughs ran an evenly paced race to place third in 19:32, while Hannah Stuart (Sr) of Edwardsville made up some ground to place fourth overall in a time of 19:51. Also finishing in under 20 minutes at 19:59 was Mallory Gard (Fr) of Rock Bridge MO- the only freshman girl to do so for the day. Edwardsville had a team score of 40 points, and Rock Bridge was not far behind with a score of 48, whose first four runners placed in the top 15 overall, but had adjusted placings in the top 10. Nerinx Hall MO (91) placed third, Highland (93) fourth, and Champaign Central (170) fifth. In the boy's race, it was a tight pack through the first mile of the race, consisting mainly of Edwardsville runners. The pack had broken up as Roland Prenzler (12) of Edwardsville came into view followed closely by teammate Jack Pifer (Jr). Cassius Havis (Jr) of Alton who went out with the lead pack, in the beginning, had now established himself in third place. Prenzler secured a stronger lead as he finished in an impressive 16:12, while Pifer ran 16:27 for second place. Havis placed third in 16:46, while two Rock Bridge teammates, Matthew Hauser (So) and Mojuba Shonekan (Sr) ran 16:48 and 16:49 for fourth and fifth place. Edwardsville's next three runners to count towards the team score of 35 points placed in the top 15. Max Hartmann (Sr) placed seventh, Henry Gruben (Jr) 10th, and Alexander Valdez (Jr) 15th. Placing second was Rock Bridge of Missouri (47), and placing third was Glen Carbon Father McGivney (152). Leading the way for Father McGivney was Tyler Guthrie (So) who placed sixth with a time of 17:00.